Celebrate the season with a lovely caffeine-free herb and fruit infusion! 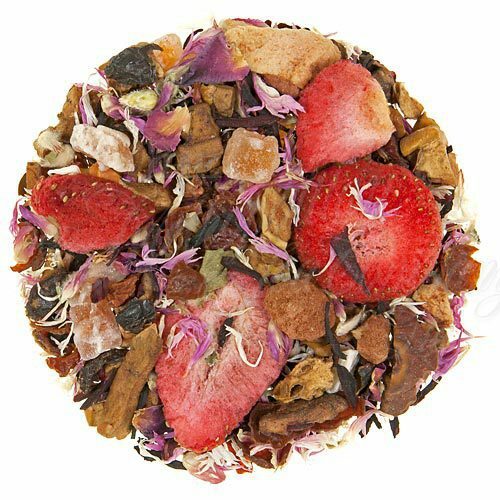 Combines apple, hibiscus, rosehip, strawberry, papaya, cocoa pieces, and cornflower petals. A fantastic gift for the tea-lover in your life! Cup Characteristics: Lovely! Delicious notes of dark chocolate with light edges of early season strawberry. Luxury Ingredients: Apple, Papaya pieces, Strawberry slices, Cocoa beans, Rosehip, Hibiscus, Cornflower petals, natural flavors. Thou shall’t not wash dishes, nor yet feed the swine. But sit on a cushion and sew a fine seam. Those lines, of course, are from “Curly Locks” by American poet James Whitcomb Riley. After reading them, our Master Taster’s mind immediately filled with visions of summer strawberries fresh from the market. Now, had he not been en route to source cocoa beans, his vision may have stopped there. However, in amongst the berries drifting through his imagination, he also began to see chocolate and cocoa intertwined with the luscious fruit. Upon his return to our tasting room, he immediately got to work crafting the tea he’d concocted in his mind. The resulting blend was Be Mine Chocolate Strawberr. A sumptuous melange of dried fruits, flowers and natural flavors. Be Mine is the perfect cup to enjoy while wiling away an afternoon sitting on cushions… sewing. (If you’re into that sort of thing.) Enjoy. Hot Tea: Put 2 slightly heaping tsp. of loose tea for each 7-9 oz/200-260 ml of water in the teapot. Pour freshly boiled water over tea. Steep 5-10 min. Garnish & sweeten to taste. Iced Tea (1 L/Qt): 12 slightly heaping tsp loose tea into teapot. Pour 1-1/4 cup/315ml boiling water on tea. Steep 5 min. Quarter fill serving pitcher with cold water. Pour into pitcher straining tea. Add ice, top-up with cold water, garnish & sweeten to taste.